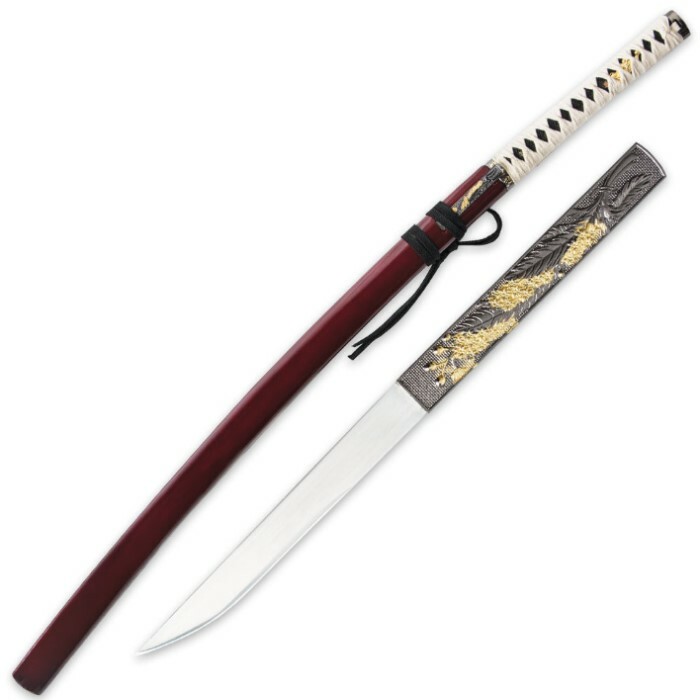 Musha Bushido Zetsurin Samurai Sword Crimson | BUDK.com - Knives & Swords At The Lowest Prices! This Musha Bushido Zetsurin Samurai Sword is another battle-ready sword from the sword masters at Musha that is priced wayyyy under anything close to this quality. The 27" hand-forged, high-carbon steel blade is full-tang and double bamboo pegged to the hardwood handle. It will slice through grass mats, water bottles and bamboo stalks with ease! The handle is wrapped tightly in nylon and conceals a hidden throwing knife. A matching wooden scabbard is included. 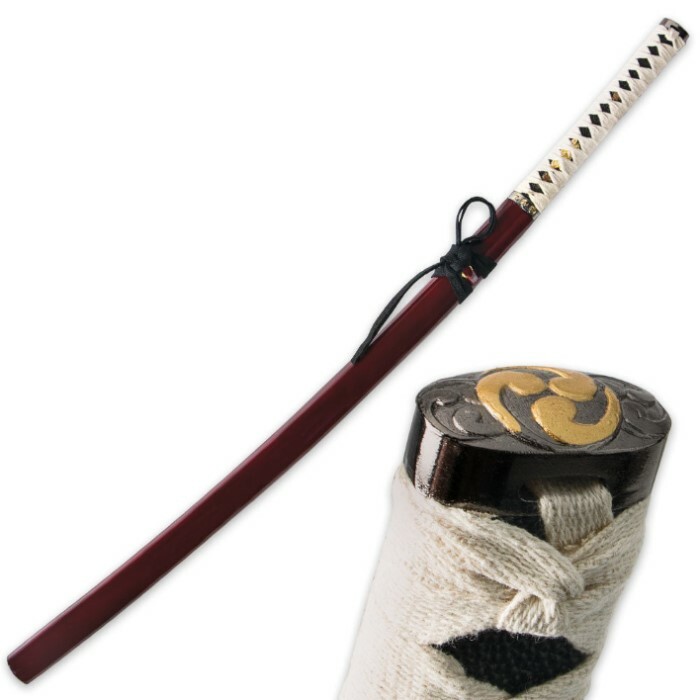 I ordered this sword expecting it to be as amazing as my first katana from budk was, but it was a huge disappointment, even both being the same brand this sword is just poor quality, plastic pommel, plastic decorative tsuba peice and plastic menuki. The description claims it is battle ready and hand forged, yet I feel this sword is more of a decoration peice not a full functional battle ready katana also hand forged swords usually don't have CHINA printed on the blade. Also the joke of a throwing knife, it would break the first time you throw it and it resembles a butter knife with an edge and sharp tip not to mention it had come lose of the saya scratching it up during shipping. But the biggest disappointment about this purchase is that the blade did not have protective oil applied to protect it during shipping and I immediately noticed a rust spot on the blade. Aside from that big mistake this sword would be a pretty display peice but if you are looking for a functional battle ready katana this is not the sword you're looking for. i received My Zetsurin in An Extremely Quick Amount Of Time. And Was Immediately Stunned By The Beauty Of The Piece, and For 70$ This Won't Break The Bank for Anyone. most Definitely A MUST Have For Your Collection, No Matter If You're An Avid Collector Or Just Starting Out Like I Am. A Great Price For A Truly Functional Blade, The Full Tang And Dual Pegs Give It A Very Solid Feel While Swinging And In Your Hand. I Was Hesitant To Disassemble At First, But With Care I Was Able To Punch Out The Pegs And Pull Off The Handle, Without breaking Anything, Reassembled And Went Out For More. This Blade Its A Great Beater For Skilled Swordsman Or Even Just Starting Out. The Blade Is Sharp From The Factory, May Not Appear "Razor" Sharp But Has A Nice Blade That With The Right Technique, Could Cut Off Your Arm. Not "Hand Forged" But For 70$ You Won't Be Disappointed. I Highly Recommend This To Anyone On The Market For A Cheap Beater, Or A Cheap Functional Wall PIece That Will Always Look Beautiful. Only Four Stars Because The Blade I Got Was Musha Instead Of Musashi, Stamped China, But Still Good Quality Carbon Steel. I Have A Natural Finish Saya Musashi Blade With Single Glued Peg With No Stamps And They Do Appear To Be The Same Blade. I Will Always Stand Behind Musashi/Musha Swords For Great Performing, Economical Blades. hope I Was Some Help! I just received my zetsurin today, and upon opening, I was stunned by the brilliance of the deep red saya, and the elegant contrast against the black rayskin and off-white tsuka-ito. I can only offer this four stars, however, because when I opened it, the small knife had come loose from the sheath, and chipped away some of the lacquer. Also, the sageo had already come half untied. I fixed the two issues by using the sageo (and a small wedge of paper) to keep the knife in place, and out of the way of the actual sword, by retying the sageo with tsuka-maki. I am immensely pleased with the sword overall, but these two points had to be addressed. This is a beautiful sword, balanced, sharp (cut right through the cardboard delivery package it came in not to mention a water bottle). Minor setbacks, it was a little loose in the saya and I had to relinquish the sawdust like residue from it when I first unsheathed it, this did not bother me as a simple cloth wiped it away. 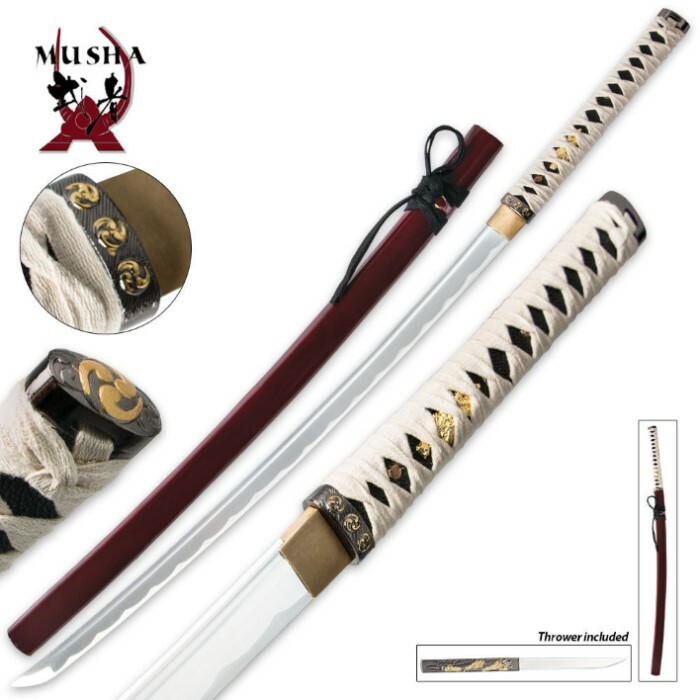 Overall this is a true steal for less than $60, Musashi is a reputable producer and here at true swords I found excellent quality in both the purchasing and shipping processes. Thank you Musashi and thank you true swords, I will be a returning customer. I only had two small problems with the sword. 1) The hidden dagger was half hanging out when I opened the box. 2) When I Unsheathed it the blade had wood splinters, all you need is a tissue or napkin and you can wipe it off no problem. Aside from that it is an extremely cool sword.